Home Costs > How Much Does a Gallon Of Paint Cost? How Much Does a Gallon Of Paint Cost? Paint can be used in many various ways. Whether you’re painting a bedroom, the outside of a home, the deck or even a car, there are so many places that you can use it. The average cost of paint will range anywhere from $20 to as much as $100 per gallon. According to Home Depot, paint designed for concrete, basements, and the garage floor will vary from $30 to $300. For example, the Sure Step 1 Gallon Clear Acrylic runs around $30 per gallon. Lowes has a calculator that can take the dimensions of your room and recommend the right amount of paint you would need to purchase. For example, a 10′ x 10′ room would require around 3 gallons for the walls and around 1 gallon to paint the ceilings. Your Faux and Decorative Pain varies anywhere from $12 to as much as $50. A gallon of BEHR Premium Plus costs around $35. A plain, typical interior paint will vary greatly depending on the brand and the quality preferred. Prices vary anywhere from $10 to $75 a gallon. Brands, such as YOLO Colorhouse, can run about $40 a gallon. Exterior paint ranges anywhere from $30 to $100. The Insl-X series, for instance, can be as much as $50+. Paint used for marine-related items or your pool can range anywhere from $30 to $75. For example, a gallon of Insl-X Black paint is $40 a gallon. Waterproofing paint is usually a little higher compared to most other paints. This paint can range anywhere from $20 to $115 per gallon. Thompson’s WaterSeal paint is $60 a gallon. NOTE: Most of the averages noted above are for a basic Eggshell paint. The average gallon of paint can cover anywhere from 325 to as much as 450 square feet. Figuring out how much paint you need isn’t really that hard. While each room is going to have windows, doors, and trim, it’s best to measure the entire room. Measure the length by width. Multiply this number, and this will be your square footage. For example, a wall 12 feet wide with 10-foot ceiling will be 120 square feet. The average gallon of paint can cover at least 325 square feet. For every door and window you have in your room, it’s best to subtract 10 to 15 square feet to play it safe. Remember you should always measure ahead of time so you don’t buy extra gallons. By purchasing extra gallons, you may not be able to return them back to the store. Since all painting jobs are different, you will need a brush, a tarp to protect the flooring and a mask to protect your lungs from fumes. Supplies, on top of the paint, can cost you $20 to $100+ extra. Paint samples can commonly cost anywhere from $1 to $5 for a tiny pint sized bucket. These samples are ideal for those who don’t know what type of paint that they want on their walls. Simply brush the paint on the wall to get a good idea of what it’s going to look like. Customized paints that don’t match up to the colors that are already offered may cost extra. With today’s technology, most of your bigger retailers can match paint to just about anything. They will put the color into the machine and the appropriate paint color code will be selected. Hiring a professional painter can vary in pricing depending on the job. A painter will charge based on the square footage, the height of the ceiling, the number of coats and complexity of the job. Many painters will charge per day or per job. Consider purchasing your paint in larger quantities. 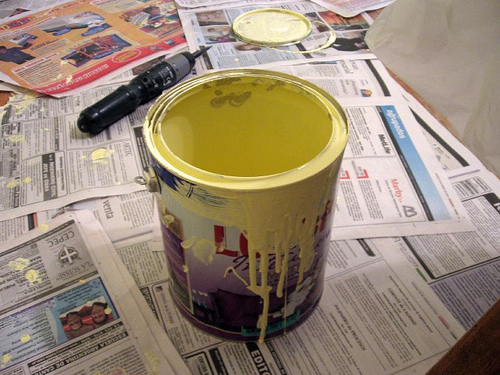 5-gallon paint cans will be cheaper than a 1-gallon paint bucket. If you’re going to a chain, such as Home Depot or Lowe’s, look for 10% off coupons on eBay to save 10% on your purchase. Bigger stores such as Sherwin Williams also have 40% off sales every so often. This is a great day to take advantage of the savings. Don’t try to be too cheap with your paints. The cheaper the paint is, the cheaper the quality may be. Studies have shown paints in the mid-grade to higher-end price ranges usually tend to be best in terms of quality.